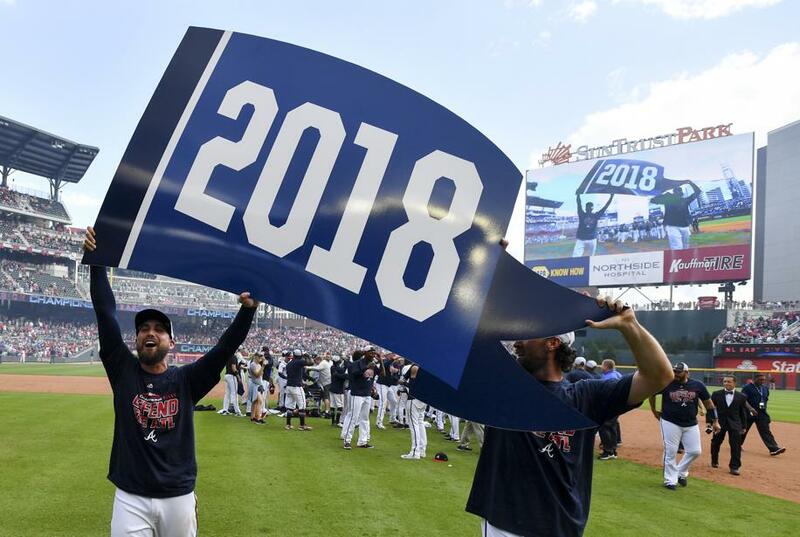 After consecutive 90 loss seasons from 2015 to 2017, analysts and insiders across all of baseball did not envision what the Braves had in store for the 2018 season. Clinching the NL East division, witnessing the blossoming of young talent across the diamond and a club that wouldn’t give up until the last out only highlights all of the incredible feats the Braves made in 2018. To start out the season in late March, the Braves won their first 3 series of the season against the Phillies, Nationals and Rockies, ending up with a 16-11 record at the end of April. They stood second place in the NL East by only one and a half games to the Mets, who had one of their best starts in franchise history but started to cool down as the Braves opened up May with a road sweep of the Mets to take first place in the division. Given that Ronald Acuña Jr. made his much-anticipated debut on April 25, these two events gave Atlanta a much-needed boost to become a legitimate threat to win the NL East title. As May went on, the Braves continued to increase their record, winding up with a 33-23 record and tied at the top spot in the NL East to finish out the month. Acuña Jr. suffered a nasty leg injury in the team’s game against the Red Sox on May 27. He hit the 10 day DL as he managed to escape the mishap with only an MCL sprain and lower back contusion. Without Acuña Jr. at the beginning of June, they fought with the Nationals for first place in the division only dipping a half game behind at most in his absence. Once he returned to the lineup, the Braves secured the top spot in the division again and extended their lead to three and a half games by the beginning of July. Once the All-Star break emerged, the Braves fell behind the Phillies by half a game. Rolling into August, it became clear to the rest of the MLB that Acuña Jr. is the next big superstar to take over the league. He managed to pull off eight home runs in eight games and three straight games where he hit a leadoff home run. The Braves seemed destined to ride his hot streak into the dog days of August to re-secure their lead in NL East over the Phillies, and they did by four and a half games towards the end of August with a 74-57 record. 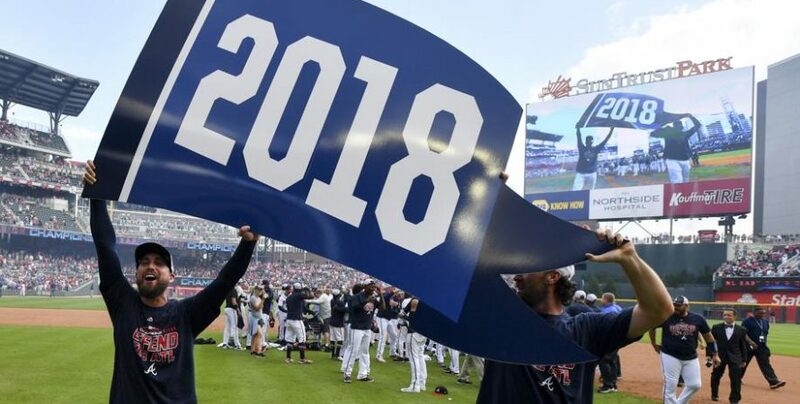 By not having made the playoffs in the past four seasons, September in 2018 was easily the biggest month in Braves history since then. Already having the lead in the division, it would take a blunder like September in 2011 to take the Braves out of the playoff question. Going into a four-game home series against the Phillies on September 20 already posting a five and a half game lead over them seemed like a chance for the Braves to put their final touches on a magical 2018 season. Not only would the Braves sweep the Phillies that series, but they also clinched the NL East on September 22, making them winners of the division for the first time since 2013. Odds Shark had posted odds for who was the most likely to win the NL East on Opening Day, and the Braves stood at with +1800, compared to the Phillies with +1000, the Mets with +450 and the Nationals with -350. This was one of many organizations and people who wrote the Braves off as contenders for the division in 2018. Atlanta knew what kind of team they had if they all executed, and they did in 2018, earning the NL East crown. Once the 2018 regular season concluded, Atlanta finished with a 90-72 record and found themselves against last years National League champs, the Los Angeles Dodgers, in the divisional round of the playoffs. Being eliminated by the Dodgers in the Braves last postseason appearance in 2013, they wanted revenge this time around. Unfortunately, the revenge plans of the Braves faltered and lost in four games. There was a bright moment in the series, as Acuña Jr. became the youngest player in MLB postseason history to hit a grand slam. After all the Braves were able to accomplish in 2018, they now set their sights onto the free agent and trade market to help improve their squad to win the World Series in 2019. Be ready Major League Baseball: the Atlanta Braves are going to be good for a long time now, and this is just the beginning.